Thanks to recent advances in streaming video technology, there are several new options for tuning into The CW and other popular TV networks. The best alternative to cable TV right now is the skinny bundle. Instead of providing channels via cable lines, skinny bundles deliver TV through the internet. Typical skinny bundle services cost $20-$40. If you have a good TV antenna and live close enough to a metropolitan area, you may be able to watch The CW and dozens more channels for free. Because most TV stations now broadcast in 1080p HD, over-the-air broadcasts often look sharper than cable. Continue reading to find out everything you need to know about how to watch The CW without cable. Before you sign up with any of the services listed below, you should know that the number of channels you get will vary depending on your location. Because many of the smaller CW TV stations haven’t worked out streaming deals yet, you may not be able to get CW through a skinny bundle TV service if you live in a rural area. All the skinny bundle providers listed below have a tool on their website that you can use to find out whether or not you can get The CW before you join. They also have free trial periods that last around 7 days. If you join a skinny bundle service and find out that you can’t get The CW in your location, simply cancel your subscription and try another skinny bundle provider. Here are the best skinny bundle providers that carry The CW. fuboTV’s $40 fubo Premier plan has 80+ channels including The CW. More Spanish-language TV channels than other skinny bundles. Sports channels you can’t find anywhere else. Lacks ESPN and other key cable channels. Though fuboTV’s TV channel menu isn’t very comprehensive, The CW is on the menu. Unlike most skinny bundle services, fuboTV doesn’t aim to be all things to all people. Judging by fuboTV’s subscription plans, fuboTV’s primary target demographic seems to be fans of sports that are hard to watch in the US. In addition, fuboTV has a much better lineup of foreign-language channels compared to the competition. Because fuboTV doesn’t carry ESPN, you may want to go with a different skinny bundle provider if you like The CW and you also watch mainstream sports. However, if you’re a fan of rugby, soccer and other sports that are more popular abroad, fuboTV could be right up your alley. In addition to having lots of rare sports and foreign-language channels, fuboTV has above average next-generation TV features. Every fuboTV subscription comes with a 30-hour cloud DVR. If you want to record more hours than that, you can – but you have to pay $10 more to unlock Advanced DVR. The Advanced DVR feature lets you record 500 hours of TV. You can’t watch fuboTV on video game consoles yet. However, fuboTV has does have apps for most of the major platforms including Apple, Amazon and Android. fuboTV has several different plans, but only one of them includes The CW. fubo Premier: $40 per month, 80+ channels. fuboTV is a unique streaming service for sports fans — and it also carries The CW. If you don’t mind the fact that fuboTV lacks ESPN, you may want to give fuboTV a try. DirecTV Now’s basic $35 plan has The CW. If you want to save money on your cable bill without sacrificing channels, DirecTV Now is the best skinny bundle out there. Other skinny bundles cost a little less, but they also have smaller menus. DirecTV Now offers more channels than any other skinny bundle, which is likely the main reason why it managed to pick up 1 million subscribers in its first year. DirecTV Now’s deluxe subscription plan is Gotta Have It. Gotta Have It costs $70, and it’s far superior to most traditional cable plans. With Gotta Have It, you get 120+ channels. Gotta Have It includes just about every major cable channel. You get The CW and all the other major broadcast networks, premium sports channels, 8 different STARZ movie channels and more. DirecTV Now’s basic plan is called Live a Little. Live a Little costs $35 and comes with 60+ other channels in addition to The CW. Aside from its larger menu of channels, the other main benefit of DirecTV Now is that once you get DirecTV Now credentials, you can unlock all kinds of bonus “TV Everywhere” content. DirecTV Now can unlock full episodes and live TV streams from ABC, A&E, AMC, BBC America, BTN2GO, BET, Bravo Now, CBS Sports, CMT, CNBC, Fox Now, IFC, FYI, History, Fox Sports GO, Disney NOW and more. Other skinny bundle services also work with some TV Everywhere partners, but no skinny bundle service is as compatible with TV Everywhere as DirecTV Now. Before you sign up with DirecTV Now, you should know that it’s still new. DirecTV Now has only been around for just over a year. As a result, it doesn’t have all the features that other skinny bundles offer. Because AT&T wanted to hurry up and stick their flag in the skinny bundle market, they went ahead and released DirecTV Now without a cloud DVR (Digital Video Recorder) feature. The good news for DirecTV Now subscribers is that DirecTV’s beta DVR has some impressive stats. When the official DirecTV Now DVR finally comes out, you’ll be able to record 100 hours of TV with it. Most skinny bundle services (with the exception of YouTube TV) limit you to 50 hours. Another weak DirecTV Now feature is that it currently only lets you stream to 2 devices at once. However, DirecTV Now recently announced that it will soon let you stream to 3 devices simultaneously. All of DirecTV’s plans include The CW. DirecTV Now’s free trial period lasts 7 days. If you have AT&T Unlimited Choice, you can buy any DirecTV Now plan for $15 less. Because DirecTV Now has just as many channels as traditional cable services, you don’t have to go on a TV diet if you switch to DirecTV Now when you cut the cord. Check it out free for 7 days and see what you think. YouTube TV’s has one $35 plan that has 50+ channels, including The CW. Like most skinny bundle providers, YouTube TV gives you the option to part ways with your cable provider without giving up cable TV. However, you have to be willing to go on a “TV diet” to enjoy the cost savings. Even though YouTube TV’s channel menu is not as robust compared to traditional cable TV plans, YouTube TV’s $35 monthly cost is a fraction of the cost most people currently pay for cable TV. YouTube TV shines when it comes to next-gen TV features. No other skinny bundle service has unlimited storage. You can record and store as many shows and hours of television as you want, and keep your recordings for 9 months. Other skinny bundle services force you to pay extra to unlock the DVR, or they limit you to a certain number of hours. Additionally, YouTube TV’s interface looks slick and is very easy to use. YouTube TV subscribers can access YouTube Red originals for no extra cost. Most YouTube Red original shows feature YouTube stars like Logan Paul and others. If you don’t follow any YouTube personalities, you probably won’t care much for YouTube’s original content. If you live near a station that broadcasts The CW, you may be able to get The CW broadcasts for free via your TV antenna. Check this FCC website to find out the exact channels you can get in your location. Amazon and Mohu both make excellent HDTV antennas. Mohu’s are a bit more stylish and generally more powerful than Amazon’s, but you may actually be better off with a low-powered antenna if you live close to a major city. Extra power can cause interference issues. AmazonBasics antennas are grouped into several different ranges: 25 mile, 35 mile, 50 mile. All 3 varieties can pull in 1080p HD feeds of The CW and other broadcast channels. Mohu antennas come in 3 different models: Leaf, Sky and Curve. Leaf antennas are extra thin and can be mounted on windows. Long range Sky Mohu antennas are designed to be mounted outside and can pull in feeds from 65 miles away. The Curve line of antennas are for people who live closer to cities. The two devices listed below let you record over-the-air broadcasts from the CW and other local TV stations. The most popular device for recording broadcast TV channels right now is HDHomeRun. Cord-cutters love SiliconDust’s HDHomeRun because it’s cheap and easy to set up. A basic HDHomeRun device costs $100, and its DVR feature is just $35 a year. First, you connect your HDHomeRun to your TV antenna. Then, you connect it to your WiFi router — and that’s it. HDHomeRun’s many apps let you watch and record TV on every popular platform. Living room devices: Apple TV, Amazon Fire TV and Android TV. Smart TVs and Blu-ray players: Sony TVs with Android TV. Mobile devices and tablets: Android, iOS and Windows Phone. Desktop browsers: macOS and Windows 10. Tablo devices start at $220. You have to buy a $50 annual subscription to unlock the programming guide and stream content to your devices outside your home network. Smart TVs and Blu-ray players: LG (based on WebOS) or devices running the Roku or Android TV platforms. If you can’t get The CW from a TV station, you can watch The CW shows via The CW’s app or website instead. 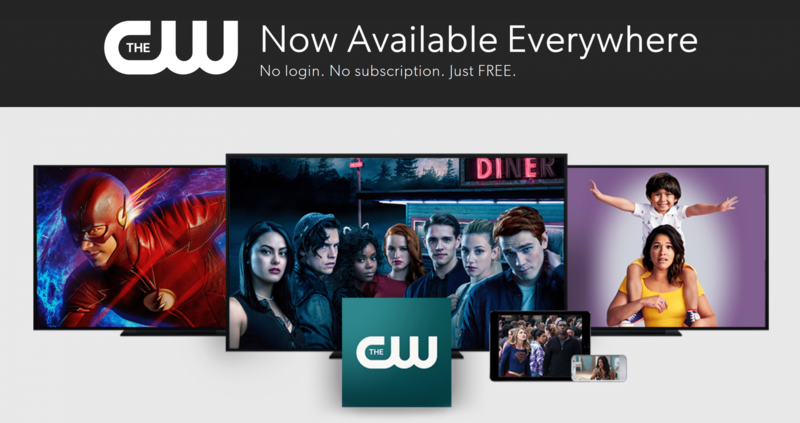 The CW has free apps for Roku, Chromecast, AirPlay, AppleTV, XBox One and Amazon Fire TV. Because DirecTV Now offers up to 120 channels, it’s a “skinny” bundle in name only. If you want to ditch your cable provider and save money without giving up The CW or your other favorite channels, DirecTV Now is the way to go. Other skinny bundle providers are slightly cheaper, but their channel menus are far more limited. If you live close to a major city, you may be quite happy with the selection of free channels you can get with a TV antenna. After you pick out a TV antenna, you may also want to get an HDHomeRun. HDHomeRun devices let you browse broadcast TV channels with a program guide and schedule recordings of your favorite shows.